Last weekend we took a little trip out and around the Kent coast, starting at Reculver. It's a beautiful place, with a ruined church on top of a Roman fort. In the distance the turbines Thames Estuary wind farms turn slowly in the summer breeze, the water silver over the sand banks. And as always, I took along a couple of cameras, and started taking photographs. Surprisingly my favourite of the day came from my phone, using the Hipstamatic image processing software. 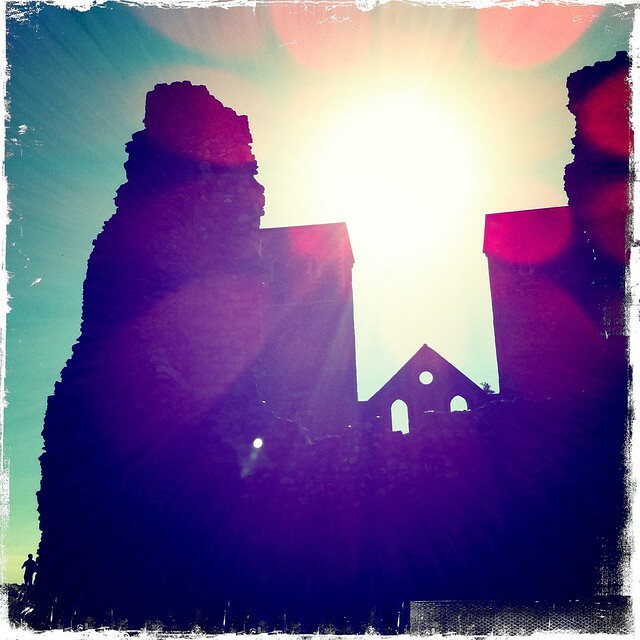 I took it lying on the grass of the old graveyard, looking up at the sun between the towers of the ruined church. Impressive. Was that rough edge also in the iPhone's photo edit options?